Information: Implements the 24 item menu and hud, as seen in Gates of Darkness demo and other things, read enclosed info. 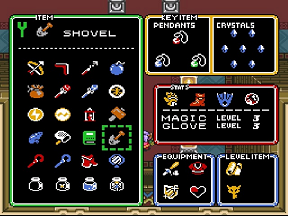 Information: This brings you the Tower of the Triforce menu (without HUD) into Zelda 3 with fully functional shovel. It only makes minor changes to the menu graphics (around 10 tiles or so). 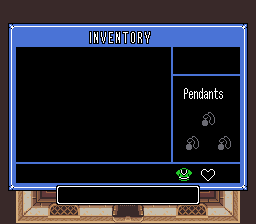 Rom: Alttp us without header.